18.03.2011 » CR7: "I prefer to play against Manchester United and not Barcelona"
Cristiano Ronaldo admitted he rather play against Manchester United (sentimental reasons) or Schalke 04 for the UEFA Champions League Quarter Finals stage. However, CR7 also confessed his wish of not facing Barcelona right now, because "they are one of the strongest teams" and contenders for this UEFA Champions League edition. 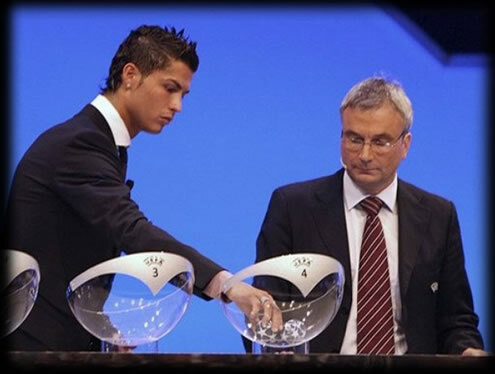 The UEFA Champions League quarter finals draw will be known this Friday. A few players from several teams, which already assured the ticket to this stage, commented on who they want or not want to face with. Cristiano Ronaldo spoke recently and had no problems in revealing that he prefers to play against Manchester United or Schalke 04, rather than play against Barcelona, at this point of the competition. Cristiano Ronaldo: "We are now in the UEFA Champions League quarter finals stage and we got here with merit. It's a very big joy and we're all very happy. It's too soon to even think at the Champions League title, because we only passed to the quarter finals and there are still plenty of great teams competing. However, we have to think everything is possible." Cristiano Ronaldo: "I would love to play against Manchester United, or perhaps Schalke 04, since that would mean Raúl will return home. I don't want to play against Barcelona in the quarter finals, because they are in my opinion one of the strongest teams." However, CR7 doesn't seem too worried if Real Madrid really gets to play against Barcelona at this stage. Cristiano Ronaldo: "I'm not afraid if the outcome of this Friday draw says we have to play against Barcelona. I'm anxious for it, so let's see what's in bag for us." The Portuguese player also approached the next Real Madrid match topic, which will take place this Saturday against Atletico Madrid, in the "Calderón". Cristiano Ronaldo: "We have to keep winning. We're playing with confidence. The Spanish League is still a priority and nonetheless, a derby is always a derby. It will be a very hard game, but I'm confident we'll be able to get the win. You can watch Atletico Madrid vs Real Madrid livestreams this Saturday, here on ronaldo7.net. Cristiano Ronaldo is very likely to play, but there will still be news on this matter in the next days. Links will be updated around 30 or 60 minutes before the match starts.